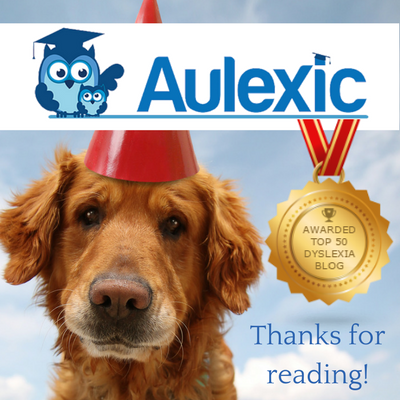 We were so thrilled and delighted to learn that Aulexic has been chosen among Feedspot’s Top 50 Dyslexia Blogs. Right now we’re ranking a beautifully healthy number 24 which I love because it shows how we have room to grow. The list is dynamic so who knows where we’ll be ranking tomorrow! I know there are ways we can make the blog even better than it currently is, but it was so rewarding to be recognised for what we’ve already created. Often blogging in today’s world can feel very isolating. I used to blog regularly in the past (about writing and freelancing) and back in the late 1990s and early 2000s blogging was one of the most highly rated social media. Sure, we had newsgroups and forums, but blogs were a fabulous way to build community. Readers regularly commented and you could connect with a fabulous dialogue. These days, that’s much harder to achieve. Our instincts now are to share our commentary on social media platforms such as Twitter or Facebook. This is great for sharing posts (and we LOVE it when you do share us!) but it takes the conversation away from the blog where we might not see it. It dilutes the interactions to individual readers social feeds. This makes it really hard to know if we’re reaching and connecting with readers. But I really do want to build a valuable resource here at Aulexic. I want dyslexics, and the parents and teachers of dyslexic children, to find Aulexic a place where they know they can learn about dyslexia, autism, language and literacy difficulties, learning difficulties, and most importantly, how to inspire children to read. Our posts are usually long and detailed because we want them richly packed with valuable information. The trouble is, these kinds of posts are time consuming to create. I’ve been working hard to try and ensure the blog continues to fill with valuable content for dyslexics and the parents and teachers of dyslexic children. It has been hard and I often feel like I’m not doing as well as I could because I don’t currently adhere to a regular blogging schedule and so releases are much more sporadic than I would like. Being dyslexic myself, it actually takes quite a long time to write blog content and polish it up to be as error free as possible. And now that I’m also recording audio readings of the text, that part of the process makes it take even longer. After all, as a dyslexic I don’t read as fluently as I could so the audio needs to be heavily edited. Thankfully, the release of our new podcast which gets blogged each week has already gone a long way to helping ensure there is fresh, regular content. I’m also working hard behind the scenes to create more compelling posts and articles; I’m ‘banking’ content. I’m developing better consistency of schedule this year as well, which will hopefully help Aulexic rise in the ranks as a go-to resource for all things dyslexia. So yay! Right now we’re ranking number 24 in the Top 50 Dyslexia Blogs. We have room to grow and we’re determined to become an even more compelling and powerful resource for the dyslexia community. So stay tuned because who knows how high we’ll rank in the years to come! Check out the other 49 Top Dyslexia blogs! Some of them are also my favourites! It’s no surprise Understood.org is ranked #1 because I absolutely agree that it’s my #1 favourite dyslexia blog too. I tweet their posts all the time on Twitter. It was also wonderful to see my friend Elisheva’s blog The Dyslexia Quest ranking well too. Aulexic is in fabulous company. Do you have a favourite dyslexia blog that’s not on the list? Share it in the comments below!